I'm always amazed at the fact that real stories are so much better than fictional ones. 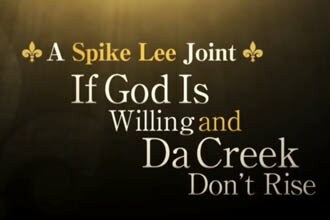 Earlier this week, I watched Spike Lee's latest documentary, “If God Is Willing and Da Creek Don't Rise”. It chronicles the journey New Orleans has been on since Hurricane Katrina. Spike's style of just letting people tell their stories with no narration is what makes the film so powerful. No script, no spin, just people recounting their experiences. I was talking to someone recently about how documentaries really bring our attention to the suffering that is all around us. For many, including myself, the aftermath of Hurricane Katrina is not something that is in the forefront of our consciousness. I think that it's sobering and helpful to have things like this documentary that take our eyes off of our personal issues and put them in the proper perspective. When we juxtapose our problems with the reality that people are enduring things that are so much more difficult than anything we've ever faced, we have a more complete context with which to view our lives. Documentaries show us a depth and complexity that exists in people, issues, organizations and moments in history that we would never grasp otherwise. What are some of your favorite documentaries? What have you learned from them? I definitely want to see it. I've been hearing good things about it.